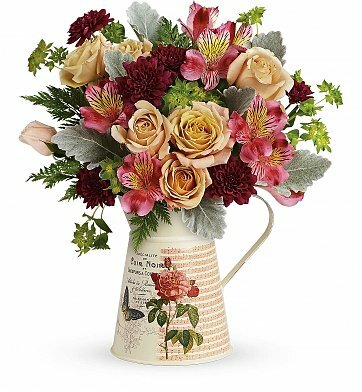 Straight from a Parisian market, this hand-glazed metal water pitcher brings the perfect vintage touch to a timeless bouquet of peach roses and burgundy mums. Dusty Miller, Leatherleaf Fern and more. Standard Arrangement Measures 11" x 13". Mod Mademoiselle Bouquet is a hand delivered gift. These gifts are delivered by one of our local design centers located throughout the United States and Canada. Same day delivery is available for most gifts when ordered before the cutoff time. The cutoff time for Mod Mademoiselle Bouquet is 2 PM in the recipient's time zone.